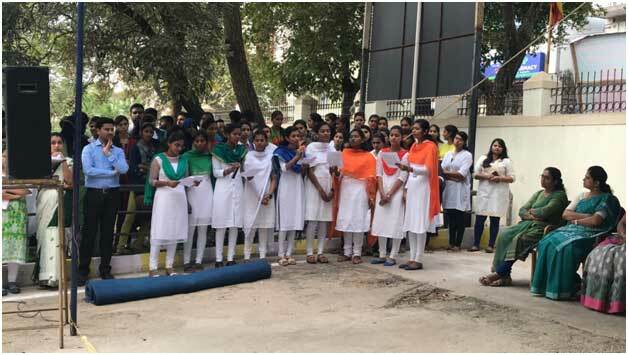 JSS College of Nursing in collaboration with JSS Institute of Speech and Hearing, JSS College of Physiotherapy, JSS School of Nursing and JSS Hostel for Physically Handicap, celebrated 70th Republic Day on 26 .01.2018 at 9 am at JSS Health Institutions premises. 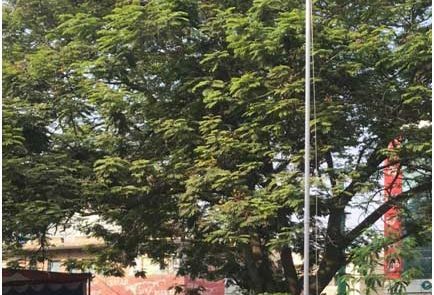 The Chief guest Brigade Vinod Adappa, former Deputy Director General, NCC, hoisted the National flag followed by song and the National Anthem. 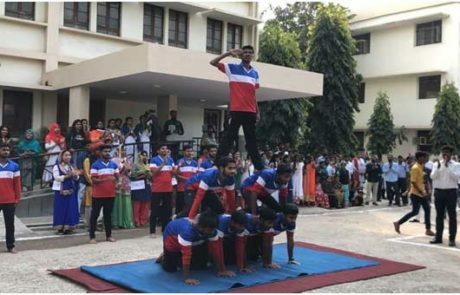 March Past , was displayed “India in 2019 presentation” -Students represented different states with their cultural costume, Pyramid Demonstration and patriotic songs sung by the students of all the Institution. The Chief guest of the programme addressed the gathering. 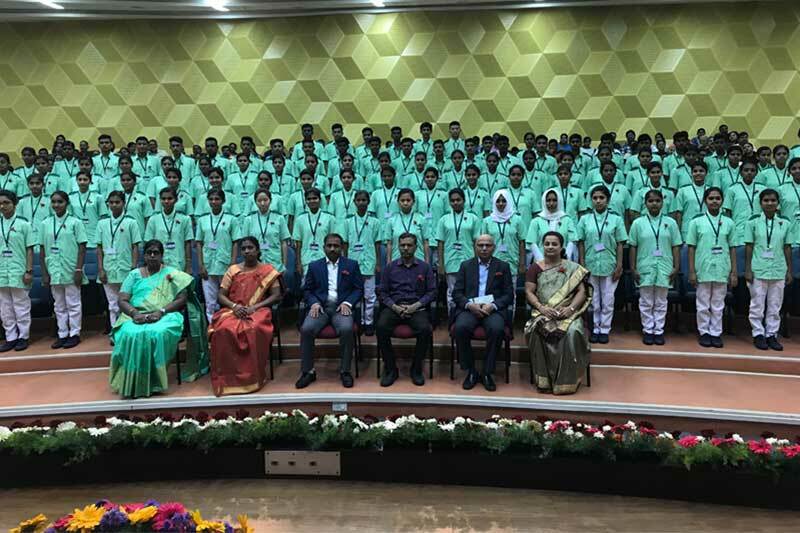 All head of Health Institutions, faculty and students were present in the programme. The programme ended by 10.30 am. Sweets item was distributed to everyone gathered. 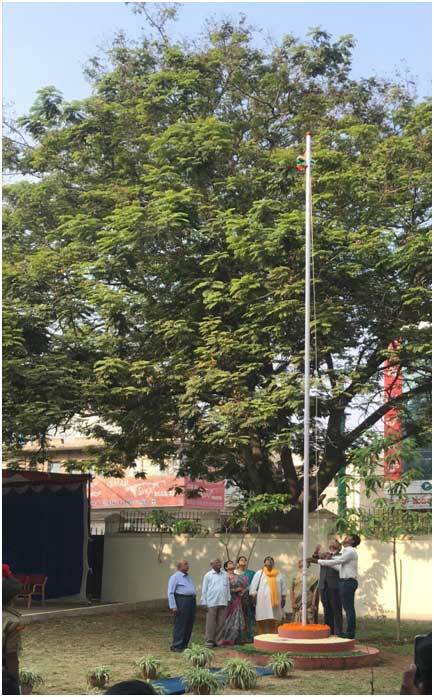 National flag hoisting by Chief guest Brigade Vinod Adappa, All Health Institutions Principal and students were present. 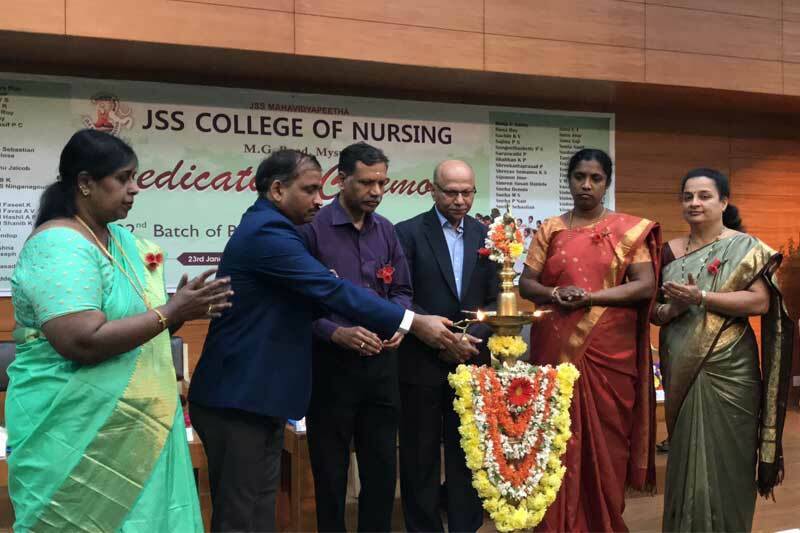 Dedication Ceremony of 22nd batch of Basic Bsc Nursing was held on 23rd January 2019 at 11am at Sri Rajendra Centenary Auditorium, JSS Hospital, Mysuru. Sri. 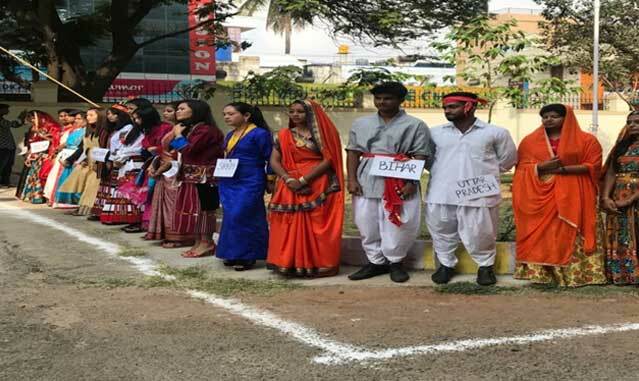 Shivanand Kapashi, IAS Registrar, Rajiv Gandhi University of Health Sciences Bengaluru was the chief guest. 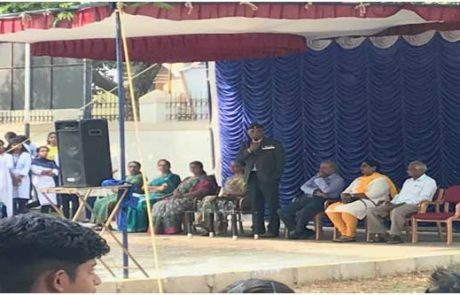 Dr. (Col)M Dayananda , Director, JSS Hospital, Mysuru, Dr. Larissa Martha Sams,Principal, Laxmi Memorial College of Nursing, Mangaluru, Sri. 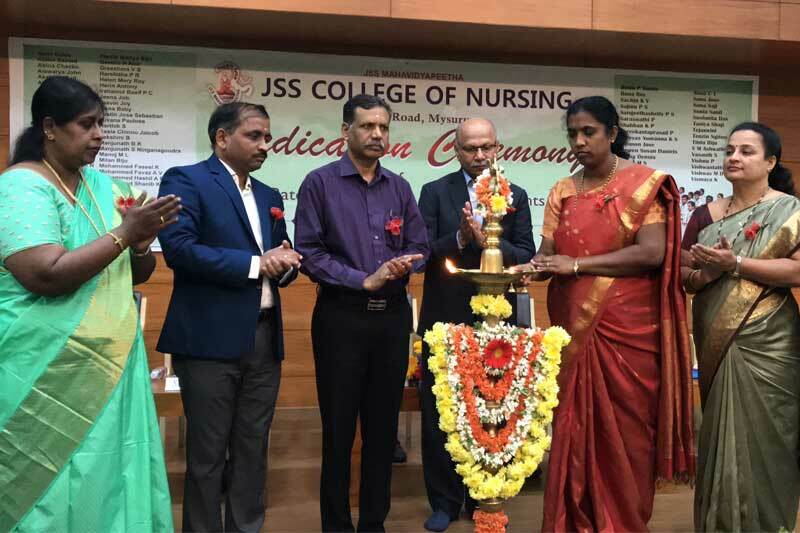 R. Mahesh, Director, Medical Education Division, JSS Mahavidyapeetha, Mrs. Janet Mathias Deputy Chief of Nursing Services, JSS hospital and Prof. Sheela Williams, Principal, JSS College of Nursing were present. 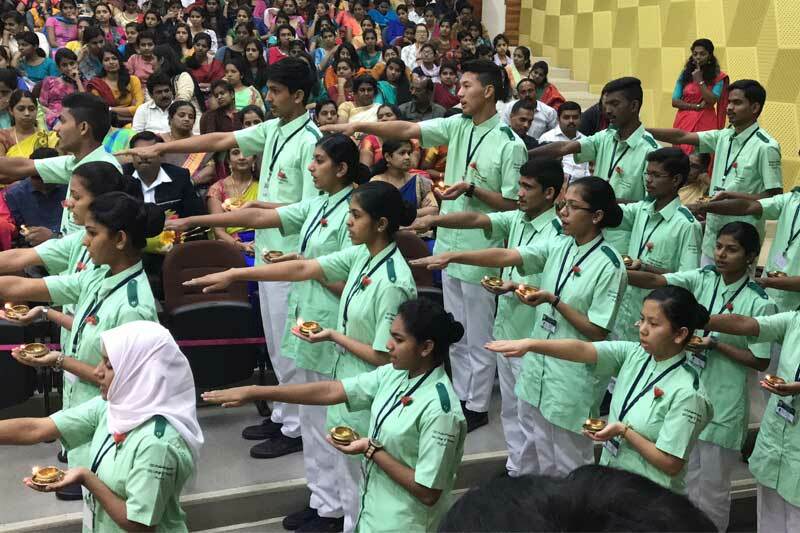 Ninety five 1st year Basic BSc nursing students lit their lamps of education and service and took oath. Chief Guest Sri.Shivanand Kapashi, IAS Registrar, Rajiv Gandhi University of Health Sciences, appreciated the discipline among nursing students and also highlighted on scope of job opportunities abroad . 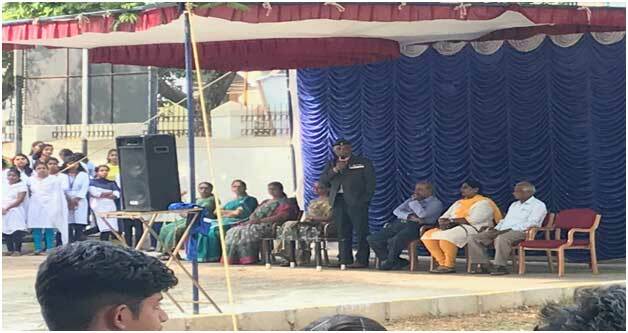 Dr. (Col) M. Dayananda, Director, JSS Hospital, Mysuru, stressed on need of competent nurses. 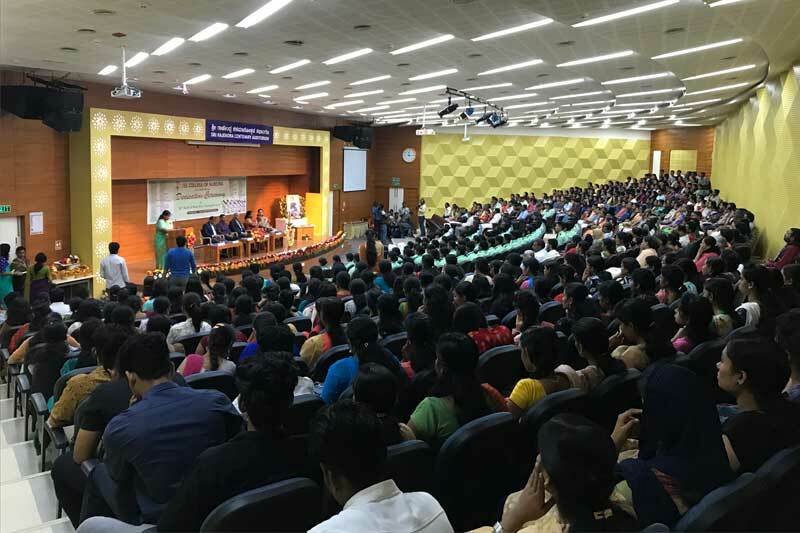 Dr. Larissa Martha Sams, Principal, Laxmi Memorial College of nursing, Mangaluru, expressed that students have to be competent nurse than just obtaining a professional degree. Sri. 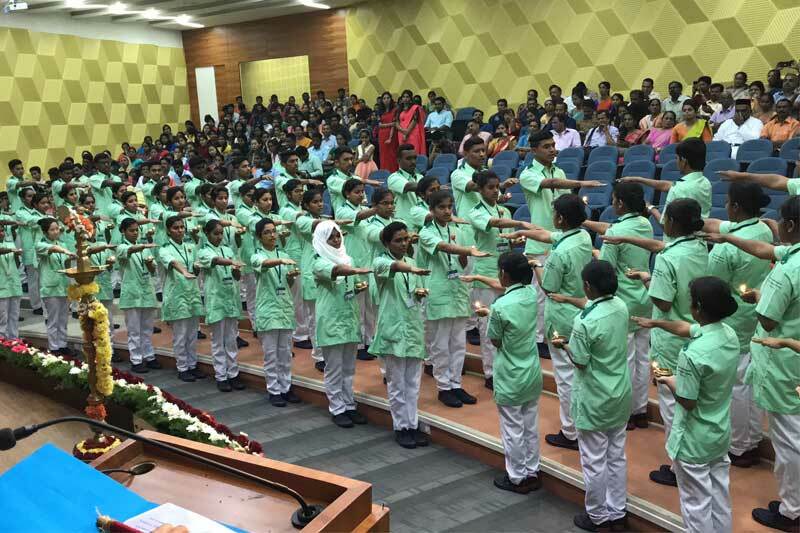 R. Mahesh, Director, Medical Education Division, JSS Mahavidyapeetha in his presidential address congratulated the parents for selecting JSS Institution for their children to study. 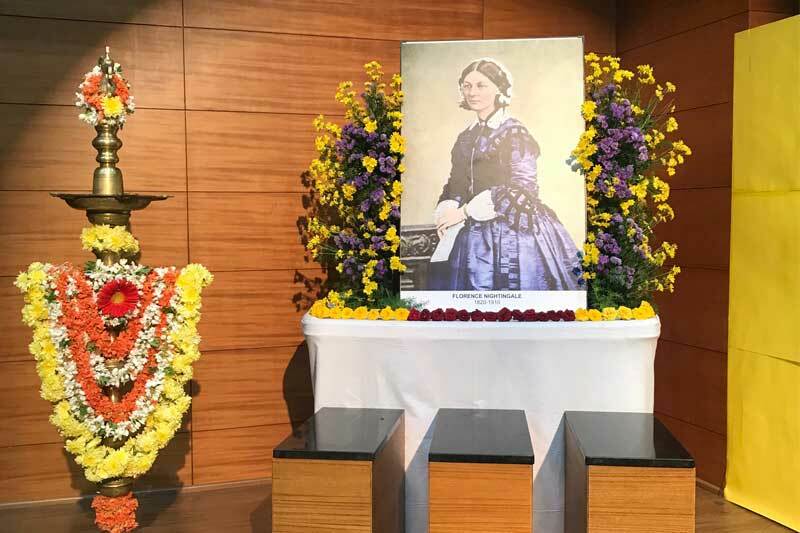 He stressed on the importance of demand for nurses globally. Post lunch Parent- Teacher meeting was conducted to discuss on the progress of new students. Annual Cultural and Literary meet Sambhrama 2018 on 12th, 13th and 14th December 2018, during which students of JSS College of Nursing participated in various cultural and literary competitions and won prizes. Inauguration of Sambhrama 2018 was formally held on 12th December at 03 pm at Dr. Sri Shivarathri Rajendra Bhavan, Mysuru. Guests were Dr. Manjunath, Registrar, JSS University of Academy for Higher Education, Mysuru and Mr. Chandan Gupta, Play back singer. 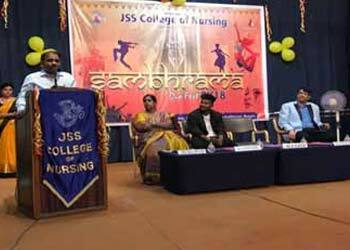 Sri R Mahesh, Director, Medical Education Division, JSS Mahavidyapeetha, Presided over the occasion. 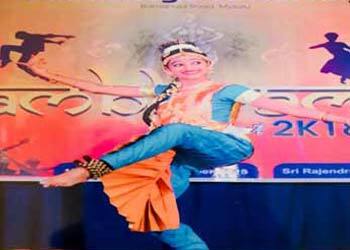 After inaugural program, at 5pm events like Solo song Indian, Solo classical dance, Solo dance Indian and solo song western were conducted. On 14th December 2018 programme started at 3 pm with Mime, Group song western, Group dance Indian, Mr. and Ms.CON were conducted followed by prize distribution for the winners. Cultural meet ended with vote of thanks at 8.30pm. 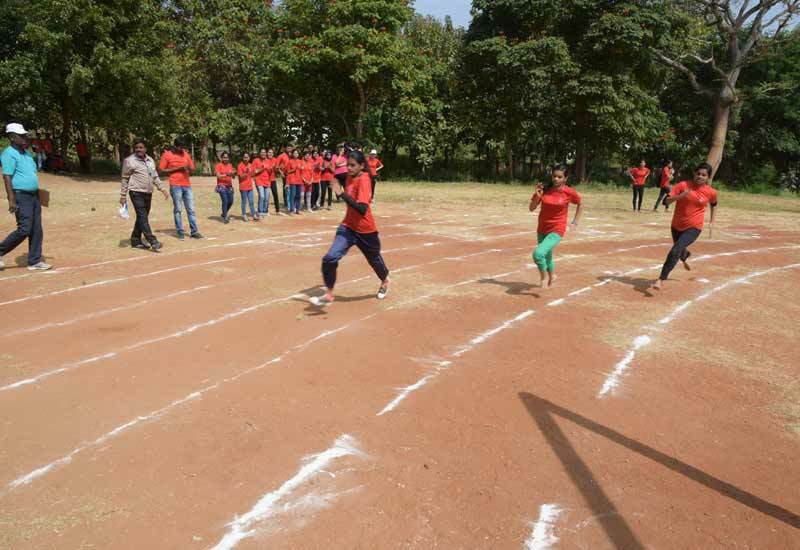 JSS College of Nursing organized Annual Sports Meet Energia 2018-19 on 8th December 2018 at JSS Public School Ground Mysuru. Students actively participated in both indoor and outdoor events. The inauguration of Energia 2018 was formally held on 8th December 2018 at the Sports ground of JSS Public School Mysuru. 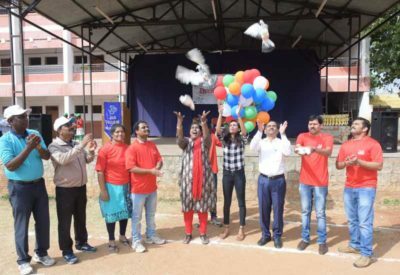 The program was inaugurated by Ms. Dhanushree M R. International Athlete Mysuru. 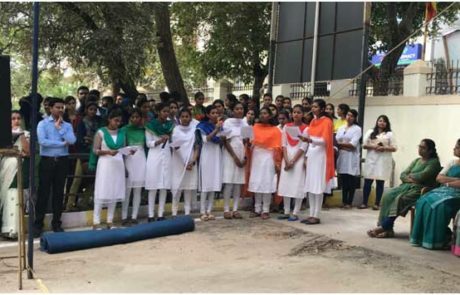 Sri Mahesh R. Director Medical Education Division JSS Mahavidyapeetha presided over the occasion and encouraged the students to participate in Sports activities. 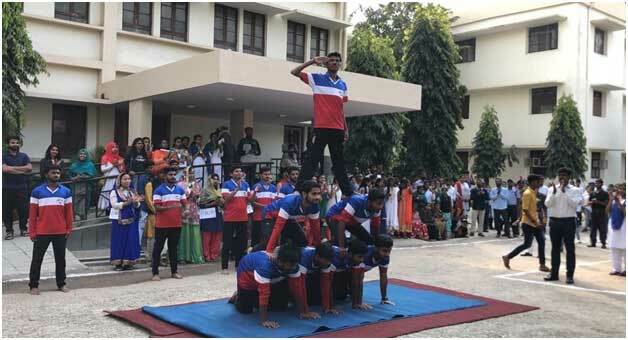 After inauguration the outdoor events like 100 meter, 200 meter running, 400 meters relay, short put, discus throw, volleyball, throw ball, long jump, high jump, three legged race was conducted. Overall champion was won by 3rd year BSc Nursing Students and Individual championship men was won by Mr. Tenzin Dasel of 2nd year PB.BSc Nursing and Individual championship women was won by Ms. Tesna Shajan of 3rd year BSc Nursing. 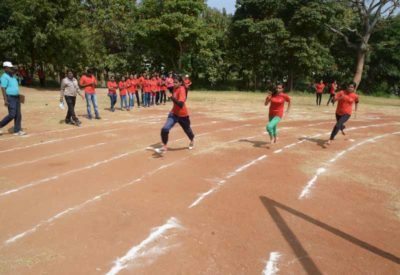 The Annual Sports Meet, Energia 2018 ended by 6.30pm with the active participation of students.